This is a follow-up learning post on a post we did recently, where we have upgraded an ESXi host via an ISO image. Today, we’ll learn how to upgrade ESXi 6.0 via Command line interface (CLI). The process of ESXi upgrade has been already documented on this blog, for previous releases (ESXi 5.x > ESXi 6.0), and we used the .ZIP upgrade file. You can read this how-to post here. But today we’ll learn How to Upgrade ESXi 6.0 to 6.5 via CLI and we’ll do another method which consists of upgrading via a VMware Online depot. Why would you want to upgrade you ESXi host via VMware online depot? It is easy to upgrade an ESXi host and also, for users who do not have easy access to the GA Offline bundle (Free ESXi users). You’ll need an internet connection on the host you’ll want to upgrade. If you have a host which does not have an internet connection, then you can simply use one of the two above. 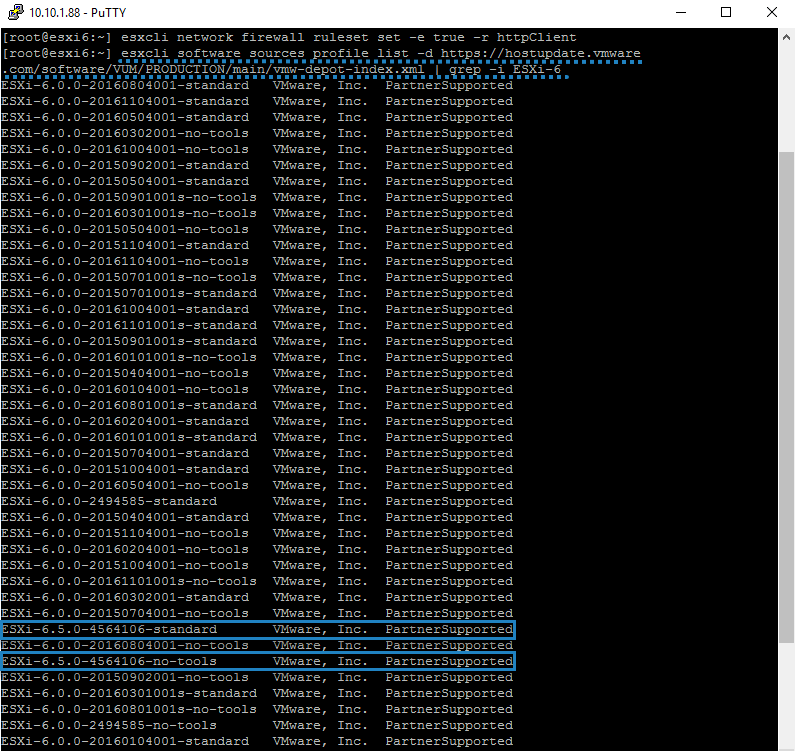 Step 2: Run this command to see the VMware online depot and the different profiles you can upgrade from. to list available profiles. (or do just the same but with …”ESXi-6.5″ at the end of the command, to see just the 2 profiles corresponding to ESXi 6.5). Or this is the original command for ESXi 6.5. Reboot the host to complete the upgrade > Exit the Maintenance mode. Here is a video detailing the steps. However, what is different between “no-tools” and “standard”? a great description as always, thank you for your time and show everything step by step! Is it possible to make upgrade of ESXi to 6.5 using HP or Dell custom ESXi image? Using “VMware online depot” and method from this articles or using “HPE Custom Image for VMware ESXi 6.5 Offline Bundle” zip file. An image profile defines the VIBs which will be installed. A “standard” profile contains VMware tools and a “no-tools” profile has no VMware tools (mostly for autodeploy). I cannot find any google help for this on ESXi. I removed and re-added the VMX to no avail. I found the issue with the above error, it was due to Unlocker208 I installed on my hypervisor to allow testing development MacOS images. I removed that and the problem is solved. Hopefully a newly compatible Unlocker becomes available. Thanks for your comment (and the info) Brian. Thank you! I was having the same problem with Unlocker208, couldn’t find an answer either! Brian, thanks for the heads up regarding unlocker. It appears as though a patch has been released for 6.5. https://github.com/DrDonk/unlocker . I have tested this on a 3rd gen NUC (re-ran the installer after the 6.5 update/reboot process) and things seem to be working fine. Hope this helps. Thank U for your comment, and I have solved the same problem. Thank you! I have solved the same problem, too! I have HP custom installation and getting the following error. VIB Hewlett-Packard_bootbank_char-hpcru_6.0.6.14-1OEM.600.0.0.2159203 requires vmkapi_2_0_0_0, but the requirement cannot be satisfied within the ImageProfile. VIB Hewlett-Packard_bootbank_char-hpilo_600.9.0.2.8-1OEM.600.0.0.2159203 requires com.vmware.driverAPI-9.2.0.0, but the requirement cannot be satisfied within the ImageProfile. 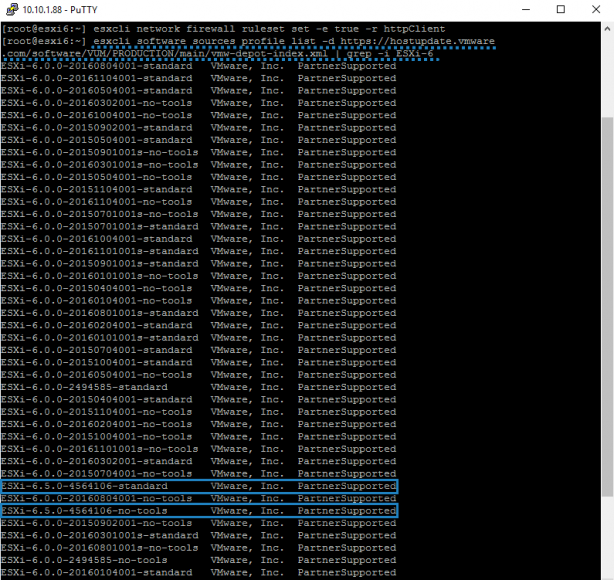 VIB Mellanox_bootbank_net-mst_2.0.0.0-1OEM.550.0.0.472560 requires com.vmware.driverAPI-9.2.0.0, but the requirement cannot be satisfied within the ImageProfile. VIB Hewlett-Packard_bootbank_char-hpilo_600.9.0.2.8-1OEM.600.0.0.2159203 requires vmkapi_2_0_0_0, but the requirement cannot be satisfied within the ImageProfile. VIB Hewlett-Packard_bootbank_char-hpcru_6.0.6.14-1OEM.600.0.0.2159203 requires com.vmware.driverAPI-9.2.0.0, but the requirement cannot be satisfied within the ImageProfile. VIB Mellanox_bootbank_net-mst_2.0.0.0-1OEM.550.0.0.472560 requires vmkapi_2_0_0_0, but the requirement cannot be satisfied within the ImageProfile. VIB Avago_bootbank_scsi-megaraid-sas_6.607.06.00-1OEM.500.0.0.472560 requires com.vmware.driverAPI-9.2.0.0, but the requirement cannot be satisfied within the ImageProfile. VIB Avago_bootbank_scsi-megaraid-sas_6.607.06.00-1OEM.500.0.0.472560 requires vmkapi_2_0_0_0, but the requirement cannot be satisfied within the ImageProfile. [[email protected]:~] but the requirement cannot be satisfied within the ImageProfile. VIB VMW_bootbank_uhci-usb-uhci_1.0-3vmw.650.0.0.4564106 requires com.vmware.driverAPI-9.2.3.0, but the requirement cannot be satisfied within the ImageProfile. VIB VMW_bootbank_scsi-fnic_1.5.0.45-3vmw.650.0.0.4564106 requires com.vmware.driverAPI-9.2.3.0, but the requirement cannot be satisfied within the ImageProfile. VIB VMW_bootbank_net-mlx4-en_1.9.7.0-1vmw.650.0.0.4564106 requires com.vmware.driverAPI-9.2.3.0, but the requirement cannot be satisfied within the ImageProfile. It was just first 3 lines, from 30…How to update HPE then to 6.5 ? Remove the VIB that created the conflict from the host and retry the upgrade. To be clear, I don’t have insight in all my sensors (RAID,etc) anymore. what does VIB Hewlett-Packard_bootbank_char-hpcru do? is it safe to remove it? Have you tried to updating the following first? Disclaimer: I am NOT using a HPE server and I did not try before. Hi Vlad I successfully updated my host -nesxi 6 via CLi and now want to upgrade to 6.5. I initially built my lab a custom iso with net55-r8168 vibs and when i did the last update it went fine. Please do you know if this vib is included in the 6.5 online upgrade so i dont loose network connectivity when i reboot. For lab scenarios. What I do, I usually pick a kind of standard 1Gb NIC (I have one Intel server with Double 1Gb slots) which I plug in the host just to maintain connectivity. The Realtec NICs are desktop hardware… you know…-:) Not sure about that. Thank you Vlad for the prompt reply. I guess am just a cheap skate 🙂 I have been using them since version esxi 4 and always manage to inject the vibs into the iso when it was no longer supported and to my surprise i had no issues updating to that very latest update of version 6 via CLi without loss of connectivity. I guess i have pay up and buy supported NICS and save myself the hustle. Can you recommend a reasonable one as my 2 host are white boxes with Old Gigabyte motherboards. I have 3 nics per a host. Thank you very much for your help. You are a star and thanks for the information you share with us, it very helpful. thanks, worked great on my pcengines apu2c4 from 6.0 to 6.5! Thanks Vladan, always great material you post. The command in step 2 just hung on me. I tried a few times. When I checked the XML file it is only 6 lines long? Did I miss something or has Vmware moved the file? can you please advise how to fix this ? or either way to downgrade to 6.0 ? Thank you Vladan for your quick answer. the VMWARE tools appears to break the speed, I’ve downgraded the tools to 10.0.9 and the problem was fixed. Yes, VMware tools. Sure. Thanks for sharing back -:). I am a neophyte on ESXi. It’s a small home system been running happily for a couple of years. Just two Vms: One Debian and the other NAS4Free(3 x drives attached through host). This is a single (SSD) drive with ESXI and the Datastore on the same partition. Maybe I made some poor config decisions ? On reboot – the Datastore is no longer present. Rescan does not find it. Rebooting brings me back to the current version. Any thought or suggestions ? Your system is home/lab system, right? Unsupported. I would try to revert back, you know, during boot CTRL + R (I think?)…. I have reverted back – sorry I was not clear. In fact – absent a Datasore – it reverts back by itself. i.e. after the first reboot it’s at 6.5 with no datastore – if I reboot again it reverts back to 6.0. The question is how can I move forward to 6.5 ? It looks like the partition table is corrupted / unable to be read following the upgrade – yet it reverts back correctly. So I’m wondering if I, while I’m at 6.5 should I rebuild the partition table and if so – am I in danger of destroying the host ? I have the vm images downloaded to my desktop – so they are at least safe. Also – do I just need to define the whole disk as a partition i.e. are the partitions that show up in 6.0 just logical (i.e. “created” by ESXi) or are they physical (on the drive itself) ? Did you resolve this issue as I am having the exact same problem. The firewall rule in clear text says httpsClient it should be the httpClient. Without the s.
Thanks. Work for me. I change only one, first I download file to server and install (offline). Hello, I’m getting an error ! VIB Chilly_bootbank_net-e1001e_1.0.0 requires vmkapi_2_0_0_0, but the requirement cannot be satisfied within the ImageProfile. VIB Chilly_bootbank_net-e1001e_1.0.0 requires com.vmware.driverAPI-9.2.0.0, but the requirement cannot be satisfied within the ImageProfile. Each time I’m looking for something a little bit new ^^ I take a look to your website ! Upgraded from ESXi 6.0u3 ISO , Works exelent, no errors after the update , thanks ! They should have the build number instead of the date. This is so confusing. Is ‘20170702001’ in ‘ESXi-6.5.0-20170702001-standard’ an American date format or European? Hi, great info but I ran into an issue. I follow your instruction and my ESXi 6 is successfully upgrade the server will show it is now at 6.5. However the problem is if I reboot the host again it will go back to 6.0. I think the upgrade went into memory??? I try to update via CD or USB key my problem is it doesn’t detect my current install and will not offer an in place. I am running ESXI 6.0.0.0 build 2494585. Does your host has a local disk/partition or USB stick where it’s currently installed, with enough space? I still have 32G of space on my drive. I run ESX off a hard drive. I notice the reboot after the 6.5 update my system ram only show 31.2GB. It seems like the update installed onto the ram. If I reboot again when it goes back to ESX 6.0 my ram show up correct as 32GB? Yes, there are enough disk space and I am not running it on USB. This article shows the upgrade via online depot. Have you tried that? The CD or USB way should work as well. It seems for some reason the storage adapter isn’t recognized. How long should this take? I have entered the commands, and it has been several minutes with no response. I am also unable to stop the command using CTRL-c. In case anyone else experiences this, I can confirm it just takes a long time. About 15 -20 minutes on one of my hosts. If someone is having the issue where it says “No space left on device.”. Go to your vSphere Center > > Configure > System Swap > Enable the swap to use one of yours DataStore. This process is taking a seriously long time. Hours and hours. Anyone know why the downloads are so insanely slow? I can fetch one of those zip files in less than a second from another machine on the same network. appreciate your site and your helpful articles! 1). which method has the least chance of corrupting one’s installed datastores, esxcli or via iso? i read some users here have had their datastores not show up after upgrade. this is a home esxi host and vm’s have been backed up to another server just in case. 2). can i upgrade straight to the 6.5.0.update02, say versus updating to 6.5.04564106 first then update again to 6.5.0.update02 version? 3). the windows vSphere exe app is no longer available for esxi 6.5 is it? we now will enter a web address to esxi host? 4). my home license is for the free version 6.0.0 if that makes a difference? Hi, your first commend needs to be aproved before going live (no need to send it 3 times. -:), I knows, WordPress is tricky about that). Now aproved. To your questions. If you’re on certified hardware (listed on VMware HCL) then you can upgrade directly from 6.0 to 6.5U1 (there isn’t any U2 as far as I know). I haven’t heard of “corrupted” datastores after upgrade. If you’re just jusing it as a home server and not for production, you can do a “Dry Run” via CLI first. Your free license should not change (unsure about that). If not you can simply create another MyVMware account to get another Free license. apologies for my ignorance of WordPress and approval time. thanks for letting me know. your upgrade instructions went flawless!! updated just fine to 6.5 using ESXi-6.5.0-4564106-standard. the version “ESXi-6.5.0-4564106-standard” being listed via the “esxcli software sources profile list …” command. the “update02-8294253” not being listed. maybe the update02 isn’t supported or something? thanks for the “dry run” tip. I will try that when get around to updating to 6.7 & using your instructions. my free license didn’t change. it stayed at same key and expiration date=never. your blog is fantastic, glad you put it out there for the community. I really thank you for a great contribution to the VMware community. This is what exactly knowledge sharing I ever wanted. I am new the VMware and your help much appreciated.